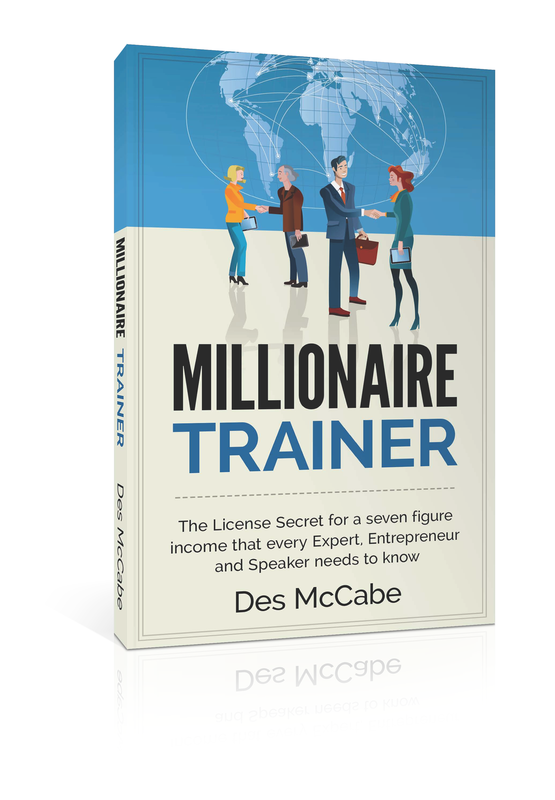 Are you serious about becoming a Millionaire Trainer? Would you like Des McCabe to work with you (and your organisation) over the next 6 months to make this happen? If so, he will support you as one of his clients. You’ll work together on the proven 12 part framework below to create a lucrative license business for you based on your expertise and experience. You’ll have the opportunity to take one of your courses, products or initiatives and start to create a seven figure business. Des will work with you over 6 months to help you make it happen. You’ll be working on a series of specific tasks each week to create your licensing structure. You’ll be following Diversiton’s proven blueprint and Des will help you to build an incredible business piece by piece. He will support you with everything you need – and it will be 100% owned by you. You and Des will meet on Skype every week to review and progress all areas. You’ll see the business unfolding in a way you will find hard to believe. You’ll be developing your own unique high income (and sustainable) national or global training infrastructure. Des will even show you how to turn it into passive income so that you can enjoy the full benefits for years to come – without any work whatsoever, if that’s what you choose. 11. Induction training of Licensees Writing of Licensee Operations Manual – systems & procedures Design of Induction Programme Delivery of Induction Training for first Licensees The ongoing day-to-day management of Licensees as they come on board. 12. Building the Licensee business Work to put in place renewals for year two Managing Licensees – key performance indicators Monitoring quality, ongoing training and support Renewals in year 2 and beyond.